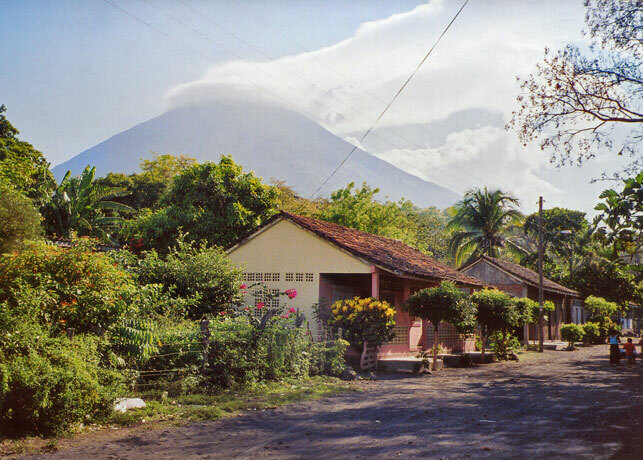 Isla Ometepe; Volcán Concepción in the background. The first time I rode into Nicaragua I found myself riding through a drought-stricken community so desperately poor that people were chasing me, begging for my water bottles. I was told later that it hadn’t rained there in six months and people were dying. At the time, however, I kept riding – I needed what little water I had for my own preservation. Nicaragua is the Western Hemisphere’s poorest country after Haiti. The devastating effects of the 1980s civil war between the leftist Sandinistas and the US-backed Contras are evident to this day. Nicaragua stood up to a bully and is still paying the price. It’s something to keep in mind as you deal with the sometimes disturbing aspects of touring here. Arriving late in Chichigalpa one night, I had to dodge gangs of severely-inebriated men staggering around the garbage-strewn streets. The only room I could find that night was so squalid (when I opened the door, rats and cockroaches scurried into the shadows) that I simply set up my tent on top of the so-called bed and “camped” on top of it. Although Nicaragua is the biggest country in Central America, it seems smaller than its neighbours when you’re cycling through it. This is because half of Nicaragua consists of the sparsely-populated, almost-roadless Miskito lowlands and because another large chunk of territory is taken up by two massive lakes (including Lake Nicaragua, the largest in Central America and 19th largest in the world). As a cyclist, restricted to roads, this means you’ll be touring the remaining inhabited areas – mostly, the Pacific Lowlands (where most Nicaraguans live) and perhaps some of the Central Highlands if you’re feeling adventurous. Ditching the bike for a couple of weeks to explore the Miskito region would be a major adventure and I’ve not yet done this. 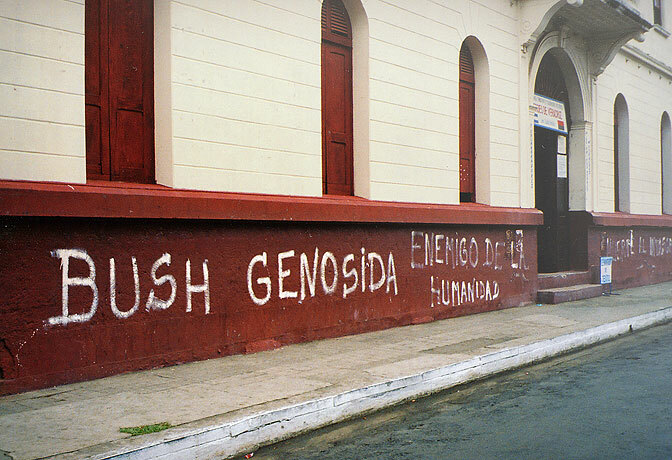 Proud and political, Nicaragua has a history of standing up to bullies. The poorly-maintained roads in the Pacific Lowlands are hot, humid, and, in places, chaotic. Ride in the early morning if possible, before the heat and havoc kicks in. During a week off the bike in León, I found myself structuring my day around extended visits to an air-conditioned supermarket near my hospedaje. I was in town to visit a clinic for a skin infection (no doubt exacerbated by the climate) and my hours spent in the supermarket was the only time my skin would stop sweating enough to heal. It might sound like I’m giving Nicaragua a bit of a bad review here. Actually, I love this country. I love the fact that Nicaragua is proud of its poets and heroes. I love that they fought back against the US during the Contras war instead of rolling over the way Honduras did. It’s a stunning place to travel and I look forward to exploring more of it. Nicaragua’s flag depicts a string of volcanoes, disappearing into the horizon and that’s exactly how it is. You follow a line of green volcanoes from one end of the country to the other. In between, are glistening lakes, crumbling colonial towns, and the wonderful Nicaraguans; proud, perseverant, and friendly (even in the more “difficult” areas). 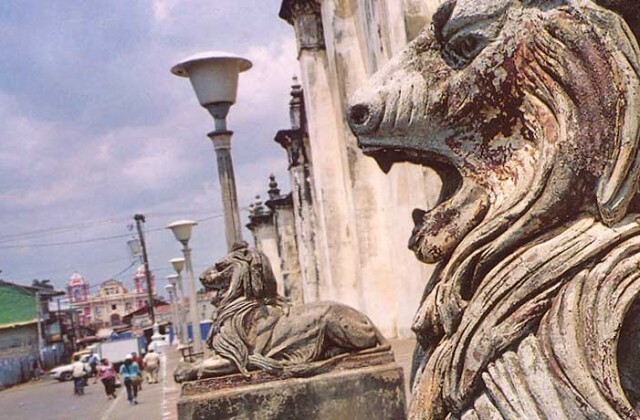 Feature image (top of page): The roaring Lions of León’s cathedral, the Basílica de la Asunción.